MIAMI, Fl., September 21, 2017 – Google Ad Technology, the leading advertising technology globally will power all iCrowdNewswire’s press release distribution products providing unmatched targeting, artificial intelligence and machine learning capabilities, Google’s translations and analytics. “if you need to target a country, state, city or zip code, with Google’s Ad Technology we will offer unmatched geographic and demographic targeting’ said Hector Botero, President of iCrowdNewswire. “this is the re-invention of the 100-year-old press release to provide unmatched ROI”. 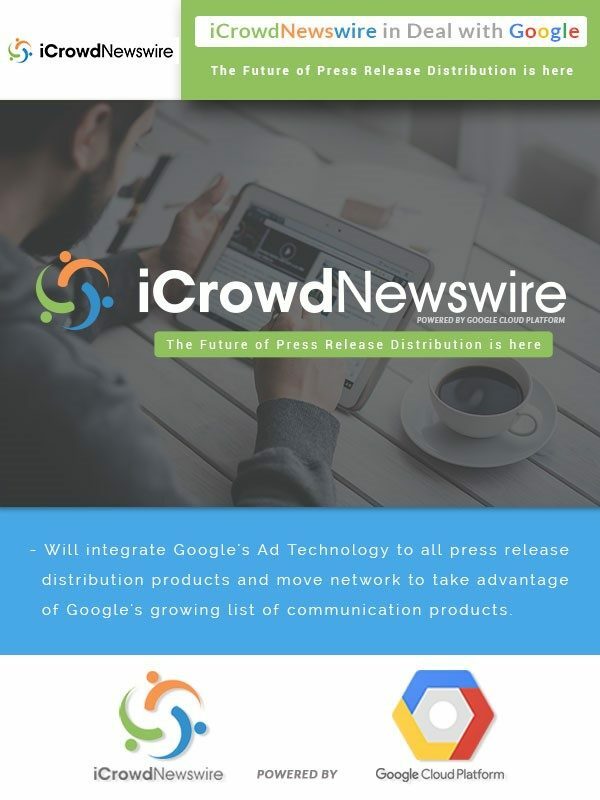 iCrowdNewswire, a leading technology and press release distribution newswire today announced it will partner with Google Cloud to re-invent the press release. The new product set will be powered by Google Cloud’s advertising technology, news, publishing, translation and analytics. Additionally, iCrowdNewswire will take advantage of Google Cloud’s artificial intelligence and machine learning capabilities. In all, Google Cloud has eight products that each has over a billion users world-wide that can be integrated in iCrowdNewswire’s SaaS solution including Google Maps that can provide unmatched targeting. As part of the deal iCrowdNewswire will move its network to the Google Cloud Platform to provide reliability, scalability, redundancy and security. iCrowdNewswire distributes more than 1,500 press releases daily from thousands of companies of all sizes. The company was launched in 2015 by a team of executives from PR Newswire, Business Wire, Marketwired, Yahoo! and Dow Jones. “Partnering with the Global leader in communications technologies is the opportunity to re-invent the corporate communications playbook” continued Botero. Instead of offering complex rate cards with one or two hundred products like the other leading newswires, iCrowdNewswire will offer a handful of choices that each can be targeted worldwide with pin point accuracy, insightful analytics and starting at $200. This deal follows the recent announcement that Marketo will also move to the Google Cloud. “Marketo Will Move Entirely onto Google’s Cloud In New Multi-Year Alliance”. “Artificial intelligence is already changing the game in marketing as can be seen in the NewsCred article here…” continued Botero. Additionally, iCrowdNewswire licenses its press release newswire SaaS technology to over twenty partners that operate fully branded (white label) end-to-end press release newswires operating with their brands – the 25 newswires will all be converted to carry the new Google Cloud enabled distribution products. A list of the iCrowdNewswire press release newswires follows. The major press release newswires combined have less than 300,000 customers, a figure that has not grown in well over a decade, in a global market with 40 million companies. The goal is to offer a short set of powerful high-tech communications products that meet the needs and fit the budgets of small SMEs to Fortune 500 and publicly traded companies enabling iCrowdNewswire to tap into a market that can be ten times the size of the current market. Launched in 2015 by a senior team of corporate communications, news and financial news services executives, iCrowdNewswire is a marketing technology, software and newswire company deploying communications software and technology with key partners in specialized market segments. As part of its strategy, iCrowdNewswire licenses software, technology, support and management services, and operational know-how and experience through white-label solutions empowering partners to launch and grow their own communications services units. You can see the iCrowdNewswire team at http://icrowdnewswire.com/about/#team.